The following is the list of the units, used to maintain and repair roads: (1) recyclers for asphalt concrete; (2) asphalt cold milling machines; (3) snow ploughs; (4) joint filling machines; (5) bush cutters; (6) sand-spreading machines; and (7) bitumen emulsion units; The recyclers for asphalt concrete are meant for repairing potholes on roads made of mastic asphalt. Additionally, the recyclers may be used to produce asphalt concrete and mixtures based on concrete or used to transport hot bitumen. The asphalt cold milling machines reclaim asphalt pavement. That means they remove the parts of the surface of the paved area to fill them with the new cement or asphalt concrete. The snow plough is considered to be one of the most effective machines to clear the roads of snow and remove the snow accumulations along the roads. Some designs of snow ploughs allow for loading snow into carrier vehicles. The joint filling machines automatically apply the tack coat prior to the asphalt laying. Sand-spreading machines are units that are mounted on tractors to spread bulky materials such as salt and sand. These machines are applied to improve road safety during snow and ice storms. The grass on the shoulders of roads or trees with a thickness of more than 80-100 mm may be cut by the special machines called “bush cutters.” There are two types of equipment for bitumen emulsion production: (1) The GlobeCore UVB-1 line of units are designed for cationic and anionic bitumen emulsion production. This construction material has gained a great popularity in the road construction industry and is used to construct and repair roads, waterproof roofs, and eliminate dust on the pit roads. (2) The GlobeCore UVB-2 units are used for the modificartion of polymer bitumen. The application of polymers for bitumen modification makes it possible to meet the needs of the road construction industry and improve every aspect of new road pavement. 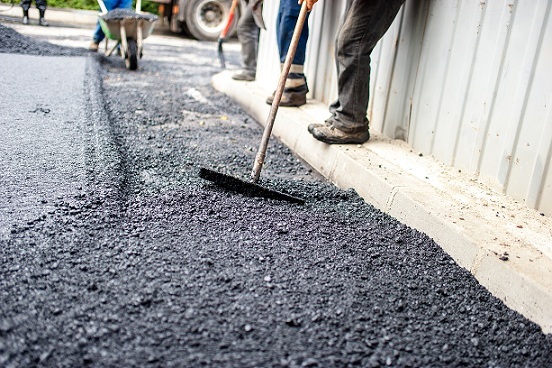 Modified bitumen is widely applied when producing asphalt concrete with improved properties to increase the durability and rutting resistance of the road surface. Both bitumen emulsion units UVB-1 and UVB-2, are produced under the GlobeCore trademark.